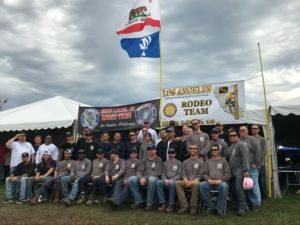 LOS ANGELES (November 7, 2017) – The Los Angeles Department of Water and Power (LADWP) and IBEW Local 18 delivered another impressive performance in the 34th Annual International Lineman’s Rodeo & Expo on Saturday, October 14 in Bonner Springs, Kansas, as one of its teams finished third in a Journeyman category and three of its individual linemen placed among the top five in Apprentice categories. The LADWP/IBEW Local 18 Journeyman team of Jason Berenbach, Mark Hughes and Michael Beach placed third in the Municipality Division. 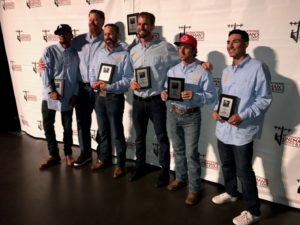 Among Apprentices, LADWP/IBEW Local 18’s Kyle Morgan finished second and Dakota Elliot fifth in the Municipality Division, while Carlos Lopez placed fourth in the Hurtman Rescue competition. The strong showing continues an LADWP/IBEW Local 18 tradition of outstanding achievement among its linemen in safety, training and performance. The team of Berenbach-Hughes-Beach finished 34th overall. Other LADWP/IBEW Local 18 competitors were the Journeyman teams of Zachary Barnes, Justin Barnes and Alan Swanson (43rd); Chris Sanchez, Salvador Flores and Anthony Vaughn (115th); and Travis Carmona, Fabian Gutierrez and Robert Charles (174th). Overall among Apprentices, Morgan placed 10th while Elliot finished 29th, David Angove finished 91st and Lopez finished 184th. LADWP/IBEW Local 18’s linemen achieved success in this year’s International Lineman’s Rodeo by working together as one with support staff, helping each other to strategize, and offering tips to each other on ways to improve their times and scores while minimizing deductions. Teamwork is a vital part of LADWP Power System operations in general. Each year since 1984, professional linemen from across the country gather to compete in the International Lineman’s Rodeo. This year 238 teams vied in the Journeyman Best of the Best competition while 313 individual contestants squared off in Apprentice Best of the Best. The primary purpose of the Lineman’s Rodeo is to help maintain a focus on safe work practices, to provide an opportunity for the public to better understand and recognize the skills that linemen use in the course of doing their jobs, and to provide an opportunity for these professionals to receive recognition in their trade. LADWP/IBEW Local 18 linemen participated in the international event after having competed in the LA Lineman’s Rodeo. The 26th edition of that event, sponsored by LADWP and Local IBEW 18, took place on April 29, 2017 in Sun Valley and brought together linemen from utilities across Southern California and beyond. Members of LADWP’s contingent at the 2017 International Lineman’s Rodeo. LADWP/IBEW Local 18 award winners at the International Lineman’s Rodeo, from L: Kyle Morgan, Michael Beach, Mark Hughes, Jason Barenbach, Dakota Elliot, and Carlos Lopez.